HOT DEALS: Asda lines up the Christmas bargains for "cyber weekend" | What Hi-Fi? HOT DEALS: Asda lines up the Christmas bargains for "cyber weekend"
Some call it Black Friday, but Asda prefers to call its pre-Christmas sale a "cyber weekend" or – worse – "geekend". The supermarket chain is lining up a series of price cuts on electrical items this weekend, including TVs, Blu-ray players, laptops, smartphones and tablets. We've already covered Asda's £40 ONN Blu-ray player, and now it's planning to offer flatscreen HDTV/DVD combis for under £100, an own-brand DAB radio for £20, big discounts on tablets including the Asus Eee Pad Transformer for £399 and a range of budget laptops from £259. Further "breakthrough deals" will be offered in the run-up to Christmas, says Asda. Many of them are designed to get Britain online as part of Asda's RaceOnline2012 commitment. 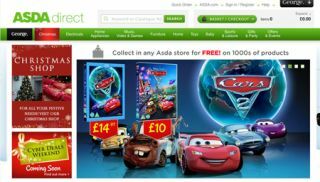 Some offers will be available in store, the rest online at Asda.co.uk/direct or by phone on 0800 952 3003.